Some of my friends joke with me and say that I change my hairstyle more often than I change my shirt. Perhaps there is a grain of truth here, though greatly exaggerated, but it is true I am in hair salons a lot for work. In fact one of my clients is an internationally renowned for their hair coloring skills and have even competed internationally having been named by Goodwill corporation as the best in Japan. The salons go by the name Coge and are located about 40 minutes outside Tokyo. The quality of work this salon produces is perhaps something you might expect in Harajuku but often the best things are a bit out of the way and hard to find. Anyhow these are the images that were submitted to the 2016 competition. I used a lot of gels in this shoot which is something I sort of got addicted to back in college 20 years back. 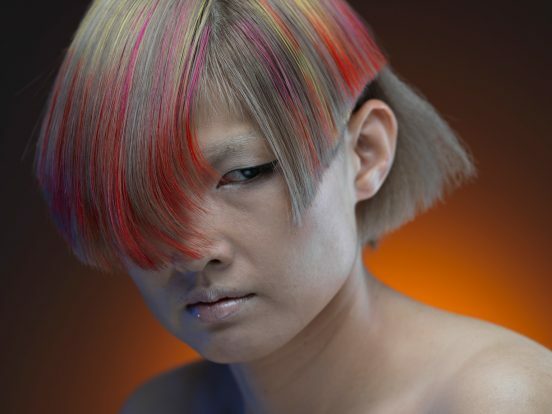 For the competition, 40% is judged on image quality a lone and the rest on execution of hair color and cut. One of the most difficult things with regards to doing hair competitions in Japan is finding someone willing or able to have their hair cut and dyed. None of the people you see here are professional models but rather students and coworkers at the salon. Hence the people seen here were not totally comfortable with being in front of a camera so it took some time to relax some of the people. Nonetheless considering the difficulties, I think they all did well. In the end Coge did end up placing in the top 10 domestically but fell just a bit short with regards to meeting the theme of the project. Better luck in 2017!